1911 (Feb. 18): 2 p. grey, ½ a. green, 2 a. 6 p. ultramarine, 4 a. olive and 3 p. grey all tied by two bold strikes of FIRST AERIAL POST / 1911 / U.P. EXHIBITION ALLAHABAD cachets in red. Reverse with registered label (443) and Allahabad cds (Feb 18) and Bombay cds of receipt. 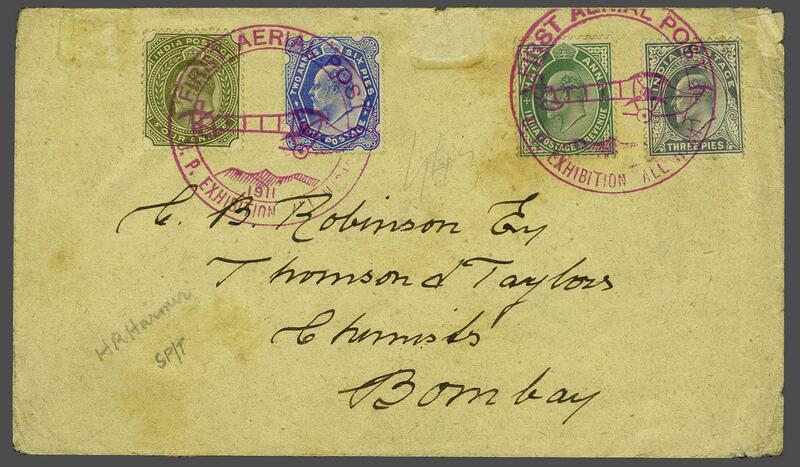 Envelope with some imperfections, but unusual franking and scarce.